On Thursday, the third and final day of Event #47: $1,500 Pot-Limit Omaha Hi-Low Split 8-or-Better played out as the final ten players of a 978-player field battled it out for the $267,345 first-place prize and 47th gold bracelet of the 2012 World Series of Poker. 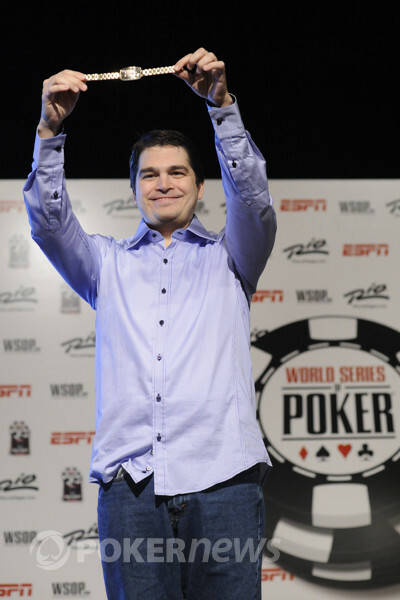 After eight hours of play, the man who walked away with the top prize and the gold was Steven Loube, a 34-year-old personal injury attorney from Atlanta, Georgia, who was playing in his first-ever WSOP event. The day start off quick when the short-stacked Viatcheslav Ortynskiy, who was crippled in the last hand of Day 2, got all in with but failed to overcome the of Sonu Sharma as the board ran out . The Russian finished in tenth place and earned $15,078 for his performance. 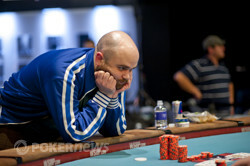 Not long after, Paul Ewen was dispatched by Tim Finne in ninth place, while Kyle Carlston, who finished fourth in this event back in 2009, followed him out the door in eighth place. The next elimination came when Loube raised to 55,000 under the gun and cleared the field all the way around to Paul Taylor in the big blind. The latter moved all in for around 125,000 and Loube snap-called. The wasn't particularly interesting, while the turn saw Loube pump his fist and say, "It's over." Indeed, Taylor was drawing dead going to the river, which came the meaningless . Taylor silently made his way to the payout desk to collect $31,634 for his seventh-place finish. A little while later, Sharma limped from under the gun plus one only to have Loube raise pot to 106,000 from the button. Finne was in the small blind and inquired with the floor as to whether or not the action would be reopened to Loube if Sharma, who started the hand with 139,000, were to move all in. The answer was no, and Finne made the call. Sharma moved in as expected, and Loube made the call. When the flop fell , Finne ended up check-folding to a pot-sized bet, leaving Sharma and Loube to turn up their cards. Loube flopped top two pair but Sharma held a big wrap. Unfortunately for the latter, the turn and river would both be dry and he would exit in sixth place for $41,589. 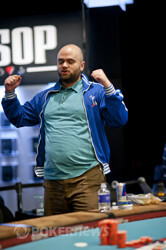 Charalampos Lappas, the start-of-the-day chip leader, was the next to go in fifth place. Lappas never got much going and was eliminated shortly after a river bluff failed. It took more than three and a half hours for the next elimination to occur, which meant four-handed play was a grueling affair. Eventually Roch Cousineau raised to 100,000 under the gun and received a call from Cameron Mckinley in the big blind. The latter checked the flop, but then woke up with a check-raise to 250,000 when his opponent bet 100,000. Cousineau made the call and then watched Mckinley move all in for around 620,000 on the turn. Cousineau, who had 570,000, shrugged and put his chips in the pot. "Big card and I scoop," Cousineau said as he held the nut low and two pair. Much to the delight of his supporters, that's exactly what he got when the peeled off on the river. Mckinley got up to leave after the hand, but after the stacks were counted down, it was discovered he was left with 50,000. Not surprisingly, Mckinley was eliminated in the very next hand, finishing fourth place and bringing about the dinner break. After returning from the dinner break, action was fast. Each of the three players took turns doubling, before Cousineau was dealt a crippling blow from Loube. On the very next hand, Cousineau would be eliminated in third place for $103,538. That does it for our coverage from Event #47: $1,500 Pot-Limit Omaha Hi-Low Split 8-or-Better. 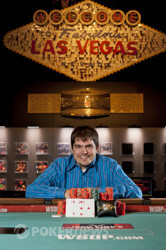 Be sure to visit our Live Reporting Section to see what other tournaments you can follow from the 2012 WSOP. Steven Loube enters his first WSOP Gold Bracelet events and wins it, besting a field of 978 players. Steven Loube began heads-up play with about a 3-to-1 chip advantage, and after a couple of small-pot hands, enjoyed about the same lead when Timothy Finne limped in from the button. Loube quickly raised the pot to 180,000, and Finne called. The flop came . Loube sat quietly for just a moment, then bet 360,000. It was Finne's turn to sit in contemplation for several seconds before announcing he was reraising all in. Loube called right away. Finne had a pair of kings and an open-ended straight draw, while Loube had a nut flush draw with backdoor low possibilities. "Heart!" yelled Loube's supporters, but the turn brought the to give Finne two pair and take away any low. The dealer then burned a card and turned over the river... the ! "Yes!" shouted Loube at the sight of the card, who after exchanging hugs with his rail shook Finne's hand. Finne finishes second, better than the three third-places he's earned at the WSOP before. A nice run, but one spot shy of the goal. Meanwhile, Steven Loube is 1-for-1... this is his very first WSOP tournament ever! In the very next hand after being crippled, Roch Cousineau moved all in for his last 60,000 on the button and was called by Steven Loube in the small blind. Tim Finne checked his option in the big, and then both players checked it down as the board ran out . Cousineau rolled over , but it was no good against the of Loube. With that, Cousineau made his exit in third place, good for $103,538. Roch Cousineau open-raised to 150,000 from the small blind, then Steven Loube didn't waste any time raising pot to 450,000. Cousineau thought a while, then called. Both checked the flop. The turn brought the and a bet of 375,000 from Cousineau. Loube rechecked his cards, exhaled, then announced he was reraising all in. Cousineau sat with his mouth open for a moment as he contemplated what to do with the 725,000 or so he had behind. Finally, after about a half-minute, he called. "High card," said Loube. He had two pair, while Cousineau was hoping to make a low and/or fill a wheel wrap. Then came the river — the ! The chips were counted down, and it was discovered Cousineau had had Loube covered by just 60,000, thus enabling Cousineau to play at least one more hand. While this didn't happen in our event, we still thought you might enjoy the following video where Kristy Arnett finds two beauties sitting at the same table, Lauren Kling and Xuan Liu, and pulled them aside for another edition of Versus. Roch Cousineau raised to 120,000 from the button and Tim Finne defended from the big blind. Both players proceeded to check the , bringing about the on the turn. This time Finne led out for 145,000, but then folded when Cousineau raised to 380,000. They've only played a couple of orbits since returning, but we've already seen three all-ins — and double-ups — in the space of just a few minutes... one for each player! In this one Timothy Finne opened for 190,000 from the button, Roch Cousineau repotted for 630,000 from the small blind, Steven Loube folded, Finne reraised all in for 645,000 total, and Cousineau called the remainder. Finne showed and Cousineau . 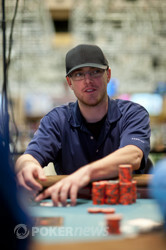 The flop came single-suited — — giving Cousineau the flush and Finne a pair of queens. Finne reacted negatively to the sight of the flop, turning away from the table. But a supporter of his on the rail was more sanguine, shouting "10!" as the dealer burned a card and delivered the turn — the ! A full house for Finne, making the river no matter. "Back to where you started," said Finne's supporter. "We're down to the skill game part," said Finne sheepishly as he gathered his chips.